Edifier W860NB Review.This headset offers a Bluetooth connection and a noise reduction system for a price almost halved to the competition. Does his performance live up to our expectations? In twenty years, the Beijing brand Edifier has built a reputation in audio, far from the prejudice that consumers can sometimes have against Chinese products. This is particularly the case for some of its pairs of amplified speakers whose value is regularly at the rendezvous. But this time, the Chinese is attacking the now highly contested market of noise reduction headsets. Technologically dominated by Bose and Sony , it is also the one where the prices are quickly delusional, exceeding 350 euros for the models of these two brands. Edifier tries to take them against a much more reasonable tariff of 199 euros. We do not reach the ultra competitive prices of his compatriot TaoTronics ( the TT-BH036 at 70 euros ), but it is expected however that Edifier does better than this poor competitor. Unfortunately, the impression that comes out of the cover of the W860NB is not the best. The design of the helmet is rather sober, but its finish is not very successful. There is play at the level of the hoop and the joints of the headphones, while the assembly of plastics tends to crack. Indices that do not reassure the evolution of the product over time. Edifier, on the other hand, gives pride of place to the modularity of use of its helmet. It can be used both wirelessly via Bluetooth (4.1) and via an audio jack cable. In both cases, we can activate or not the noise reduction. This is a very good point for the manufacturer against its competitors who do not generally leave the choice. Result: their helmet is unusable as soon as the battery is discharged. We will not have to worry about that with the W860NB. Especially that its autonomy is absolutely exceptional. This is undoubtedly the highlight of this device. With the noise canceling system activated, we reach the record of 33 hours 39 of use without having to reload it. It exceeds the score of Sony WH-1000XM3 which had reached 30h 08. And if that’s not enough, you can turn off the noise reduction to almost double the range at 62 h 41! Suffice to say that you will have time to see you before you find out of music. 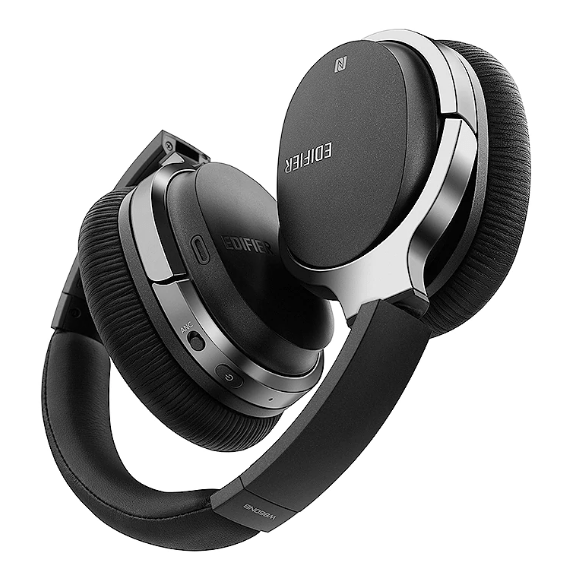 However, is the noise cancellation system effective? We had in the past crossed some devices which this process seemed to exist only at the level of their technical sheet. This was for example the case of the TaoTronics mentioned above or the true wireless headphones from Sony . With the W860NB, Edifier is average. Less effective than the kings Bose and Sony for now still indestrônables, the Chinese offers however an effective solution for the continuous background noise, typically in transport. This headset is however more difficult to mitigate surrounding conversations or more sudden noises (subway ring, door slam, etc.). Nevertheless, we note that his performance is honorable in this area. Once immersed in this relative calm, it is necessary that the sound quality is also at the rendezvous. In this area Edifier blows hot and cold. Noise cancellation disabled, the rendering is warm: the bass is present without being stuffy, while the midrange and treble are well represented. This good overall impression is unfortunately degraded once the noise cancellation is activated. The treble and high midrange are always well detailed, but the bass fly away completely and really lack to give the necessary relief to the music. For a first test in the field of noise reduction headphones, Edifier succeeds … only in part. The system is efficient and the flexibility of use (in wire, in Bluetooth, “noise cancellation” lit or not) very appreciable. Now remains the Chinese brand to refine the sound when noise reduction is activated to really be an attractive alternative to the high-end competition. On the other hand, if you are looking for a champion of autonomy, your choice is now all found.